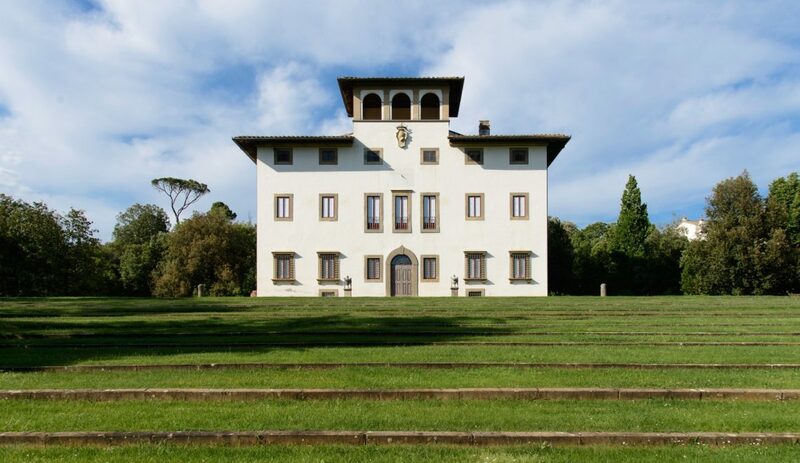 The Villa Granaiolo in Castelfiorentino, once a 13th-century fortress, is where the Marchese di Barsento Emilio Pucci and his wife, Cristina, used to host glamorous parties in the 1960s. 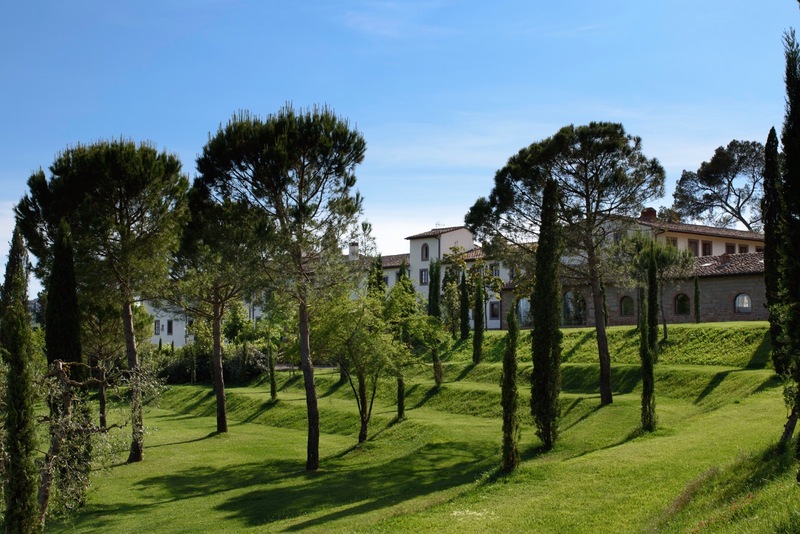 Visible from the green steps of the villa is the former convent where the Marchese’s daughter, Laudomia Pucci, has made a home for holidays with her husband, whom she married in the family chapel there, and their three children. Laudomia, as was her father, is tall and thin with exceedingly expressive eyes. Her voice is cheerful and kind; her manner always animated. 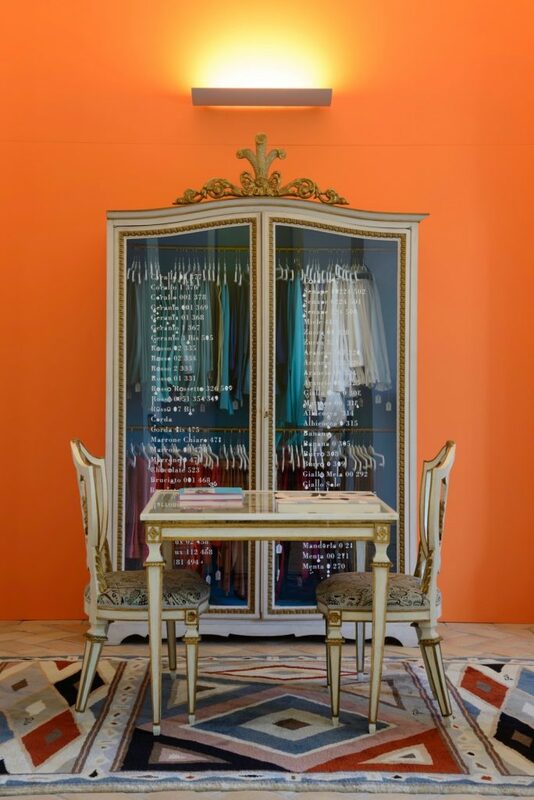 She speaks about tradition, Renaissance, and politics with the ease and familiarity of ordinary conversation, and her irresistible enthusiasm draws you into the colorful world of Pucci. 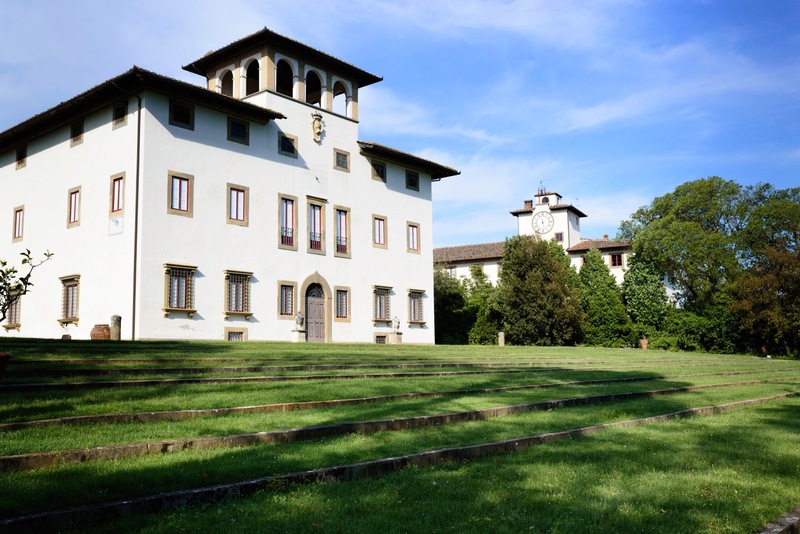 View of Villa Granaiolo and the convent that was transformed into a home for Laudomia Pucci and her family in Tuscany, Italy. View of the exhibition Elements curated by Maria Luisa Frisa. 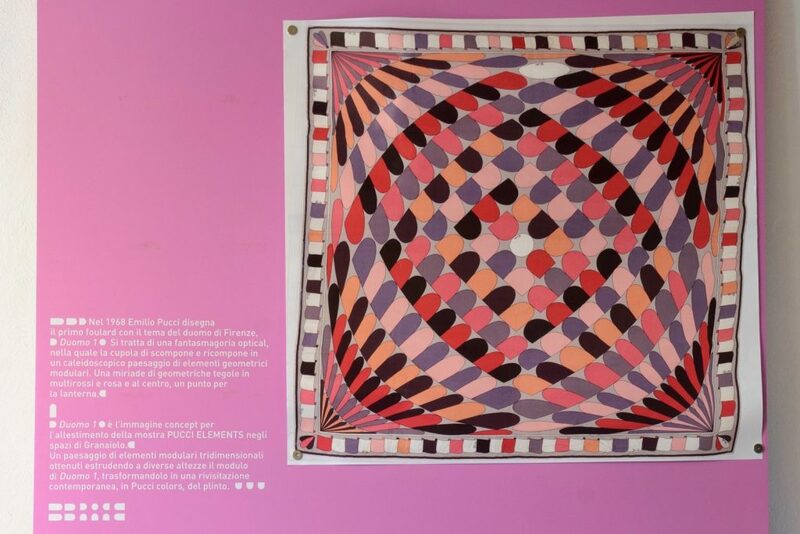 The scarf that inspired the layout of the exhibition. 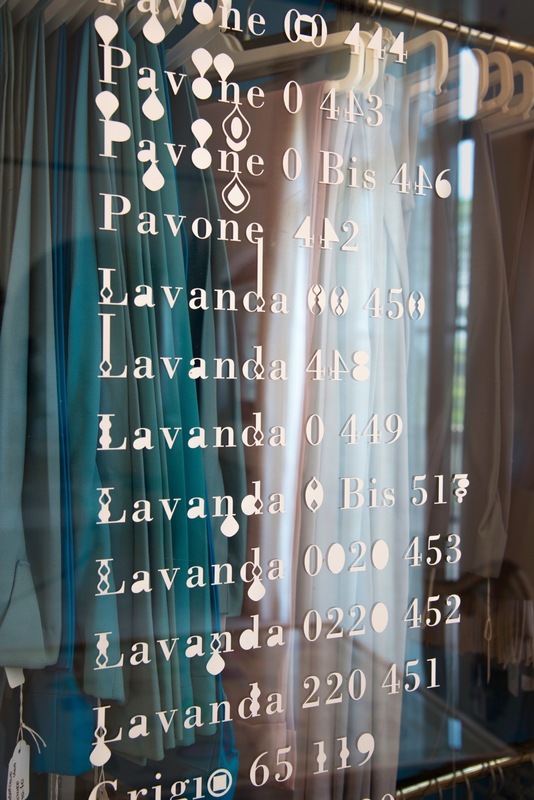 Cupboards from the very first boutique in Florence. 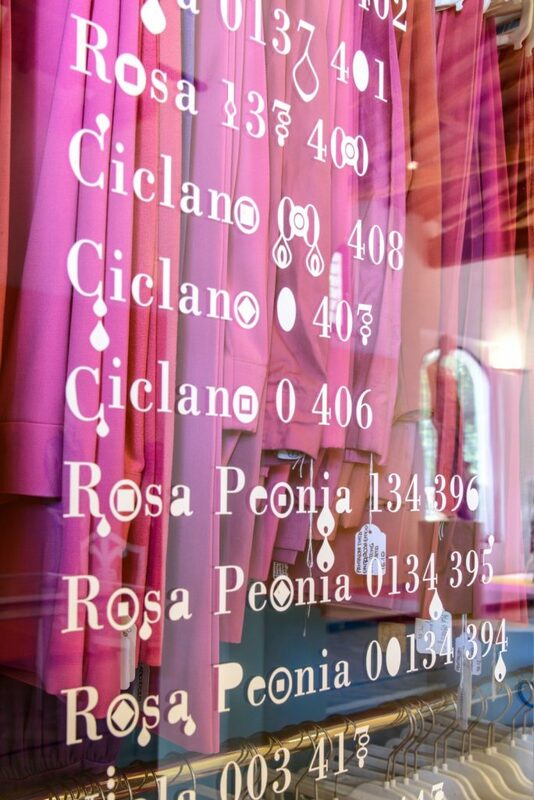 On the glass doors is the index of the colors with names like rosa bonbon or geranio followed by a number. The capsules enclosing items from the archives. 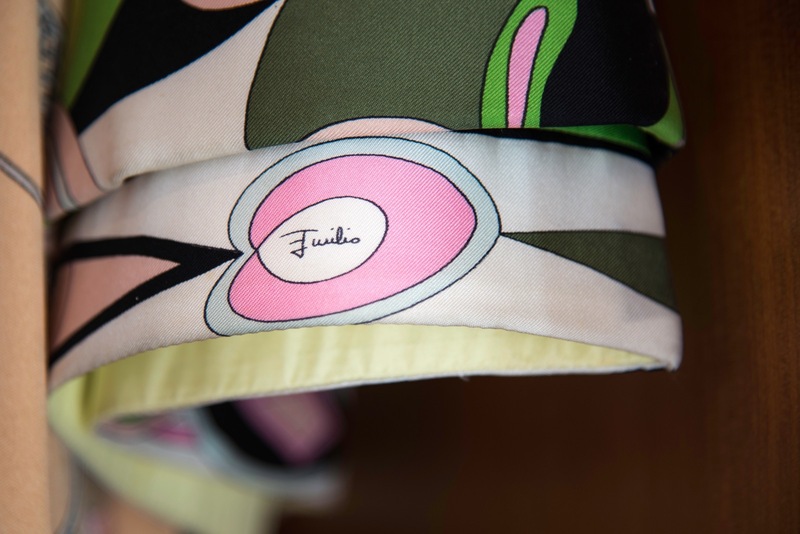 Emilio Pucci signed his creations with his first name. Mannequins wearing pieces of the collection. Detail of the intricate embroidery. 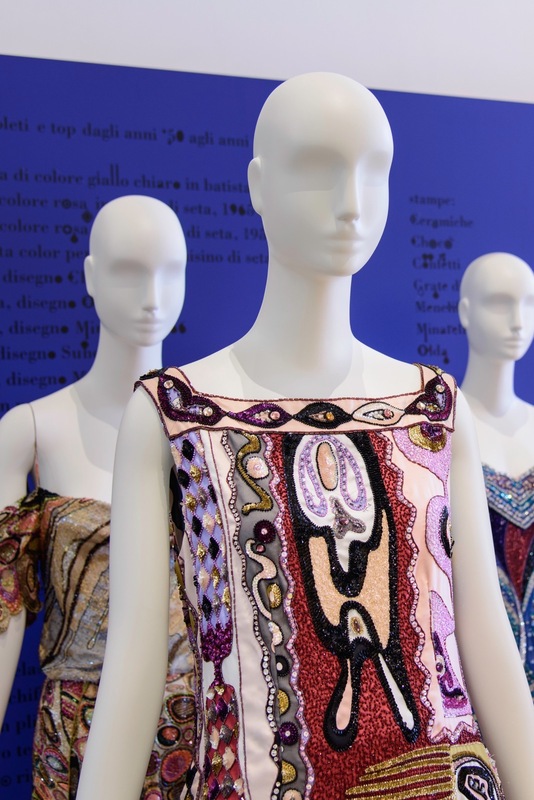 Trademark chiffon dresses designed by Emilio Pucci. 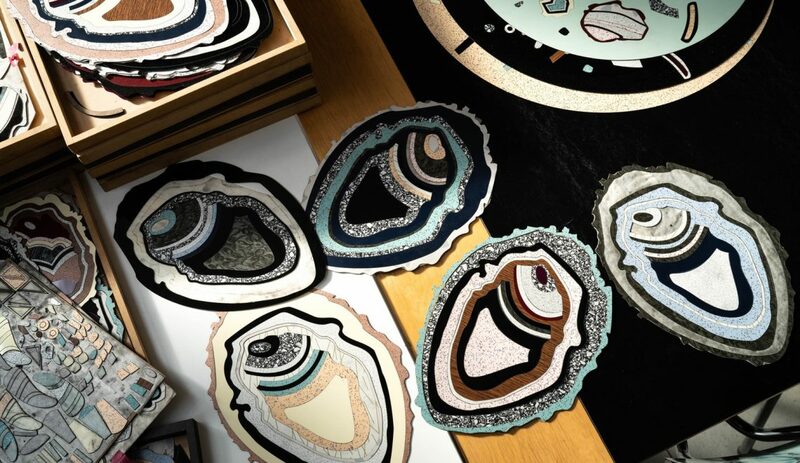 Laudomia’s goal is not only to preserve her father’s legacy, but to create the new. Next to the installation is a talent center with big drawing tables that serves as a studio. 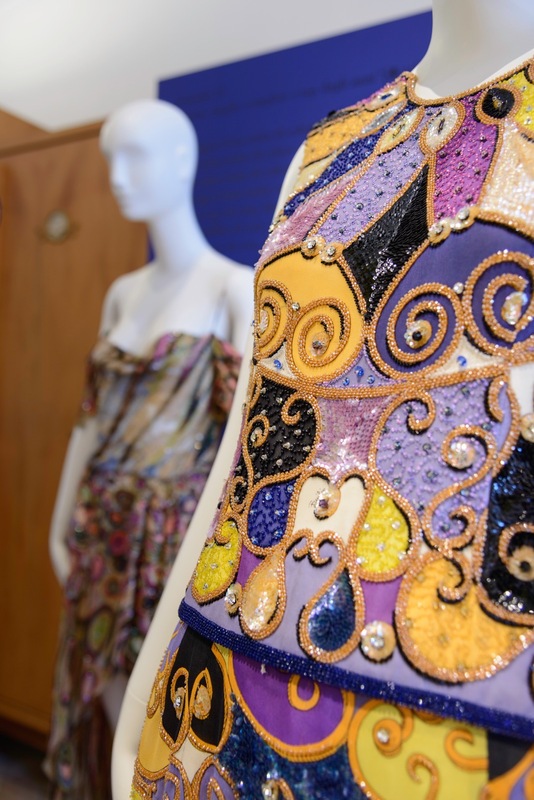 There, LVMH, which acquired 67% of Emilio Pucci in 2000, organized Les Journées Particulières, an open house weekend initiative for all its brands where experienced artisans showcase their savoir-faire to the public. 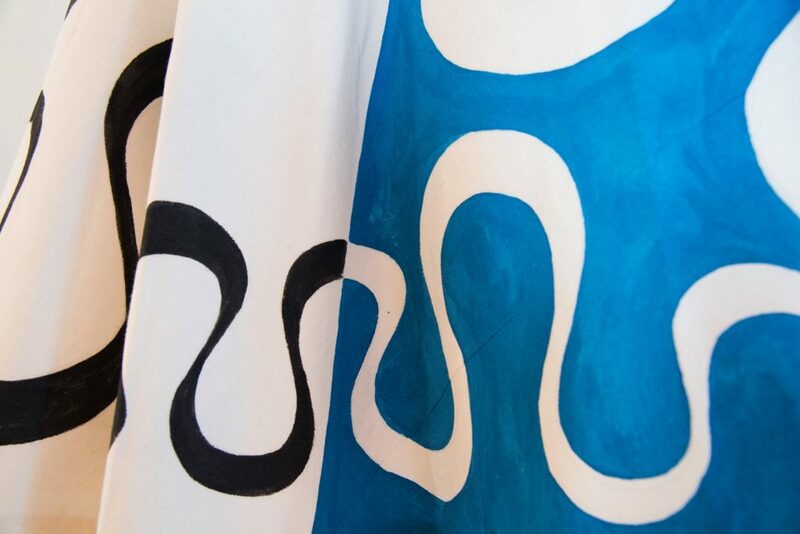 “We had print design and pattern making, with approximately 2500 visitors.” Les Journées Particulières occurs only every two years, but every year students from Polimoda (Florence), ECAL (Lausanne) and Central Saint Martins (London) are invited to see the archives and, inspired by those, to come up with new ideas. “At one point I was wondering, is it interesting only for me, the archives? Is it passé? Is it museum stuff? So the only way to get a clear answer was to go to the very young and see what they would tell me… and there I realized that the archives are relevant not only for me, but for a creative group of people. We found young talent who now work for us.” Some of the prototypes are on display such as a Pucci skateboard or an interactive scarf designed by former ECAL student Pauline Saglio that lights up and plays a melodic tune. View of the drawing table in the talent center. Limited edition skateboards, designed in the talent center. 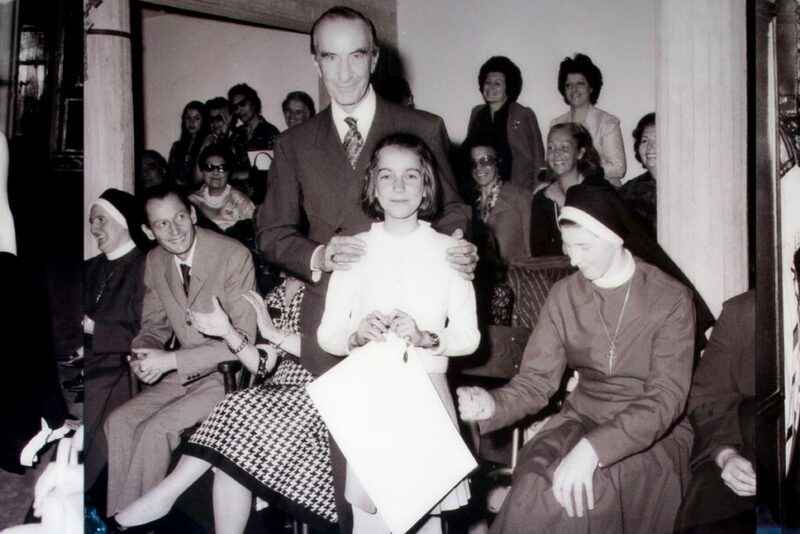 Emilio Pucci with his daughter Laudomia. 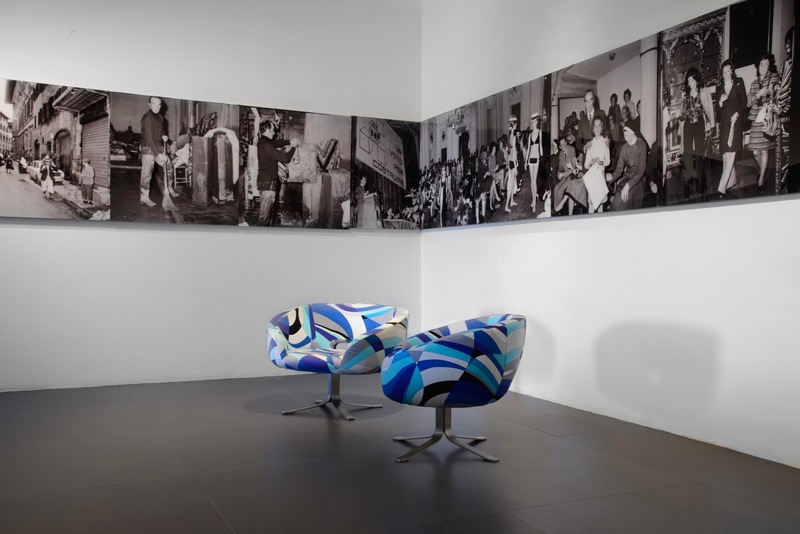 Strip of historical black and white photos, narrating the history of the house. View of Laudomia Pucci’s home, museum and talent center. 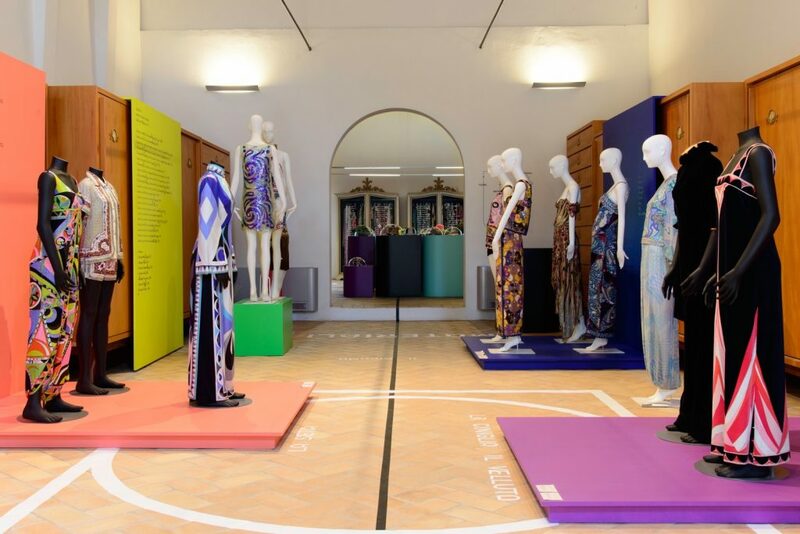 Family portrait and Emilio Pucci’s mannequins. The tapestry that decorates the wall was specially designed for Laudomia by Italian artist Francesco Vezzoli . 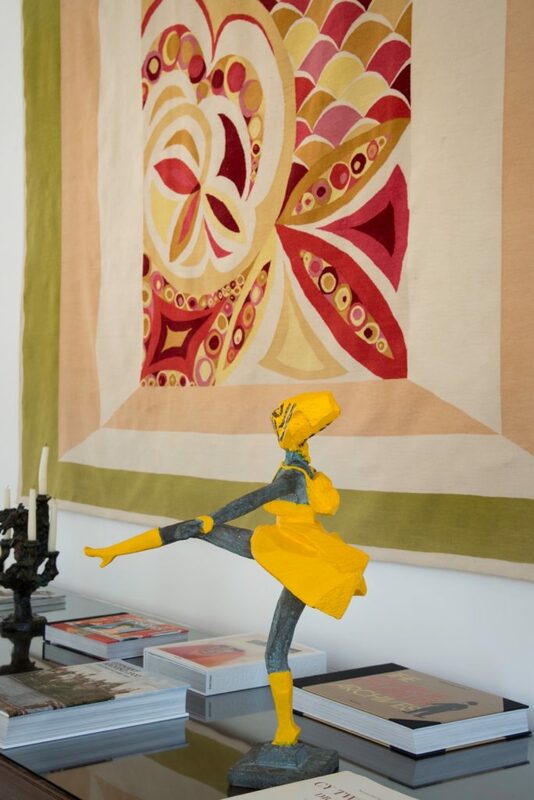 Tapestry by Francesco Vezzoli and dancer sculpture by Ju Ming. 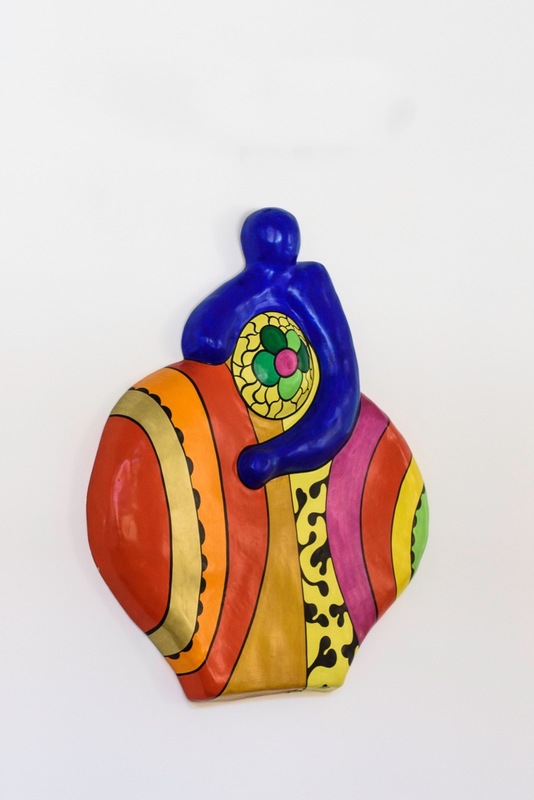 Niki de Saint Phalle wall sculpture. 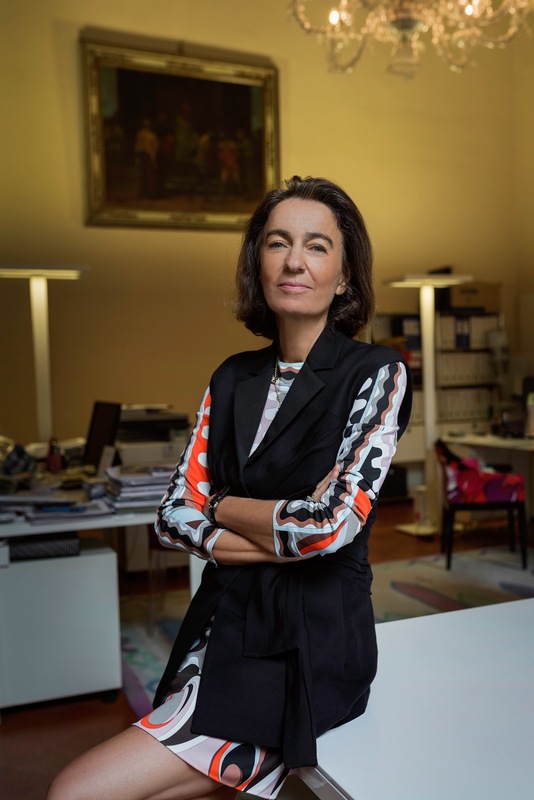 Laudomia photographed in Palazzo Pucci in Florence. View of the gallery in Palazzo Pucci in Florence. The images are lush and exceedingly beautiful. 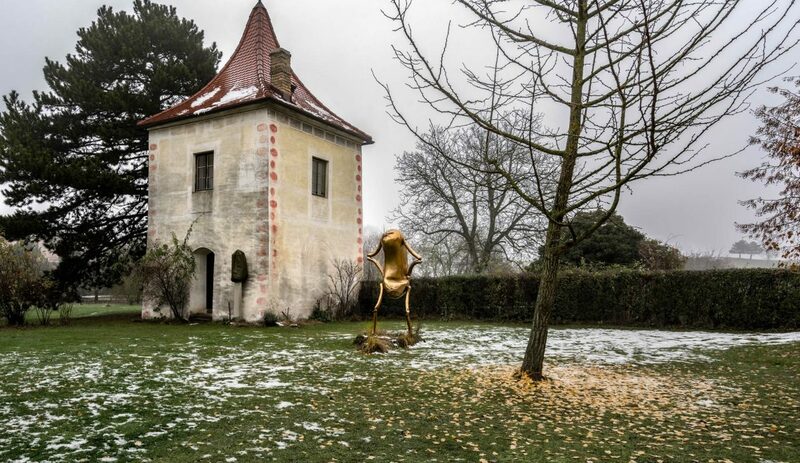 I hope to visit Granaiolo one day. Unexpected and delightful! 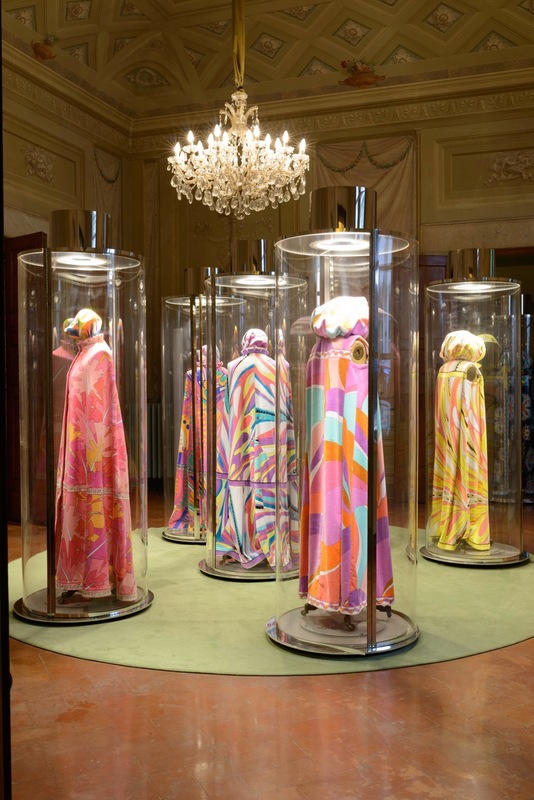 I’ve been dazzled by the truly alluring Emilio Pucci fashions. 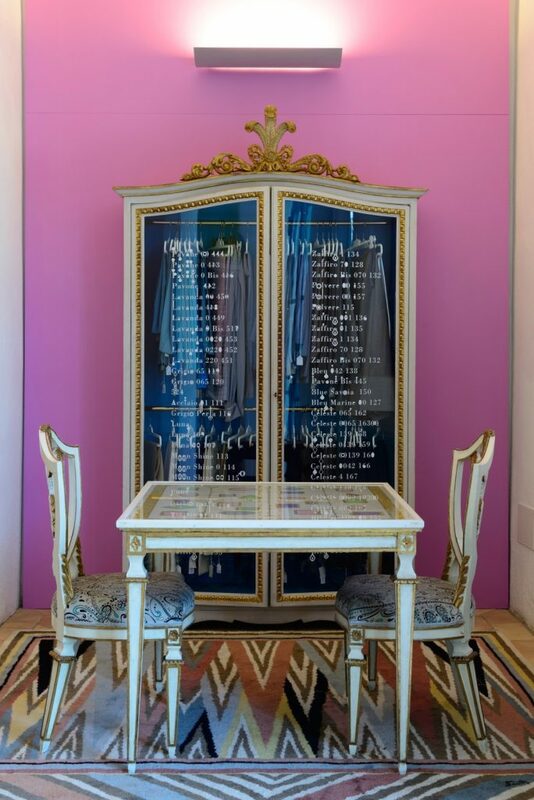 The article is a revealing look into Emilio’s life and legacy, an enjoyable read for the true fashion lover and connoisseur. An excellent pictorial overview ! Fabulous house and loved the interview! Divine mixture of classic and modern. Thank you! 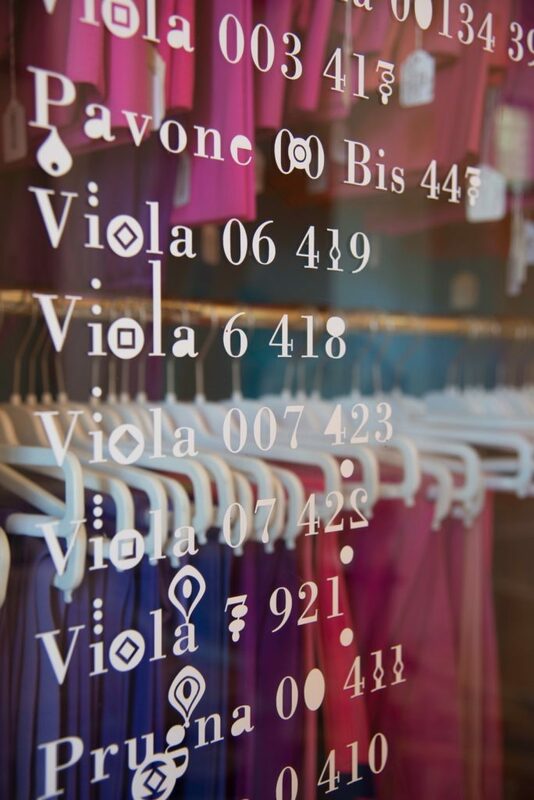 Will send you an email. Wonderful pictures! So much color and beauty! Love the way Laudomia has preserved all this heritage. Wonderful interview, beautifully written.